Yet, without words Tao is proclaimed. 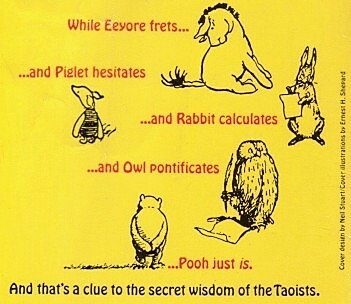 Yet, naming Tao leads us to think of Tao as such. Yet, it can be observed in all things. Yet, Tao does not itself have being. Yet, Tao is a “pathless way”. Yet no other can understand or perform them. Yet these cannot be known and I cannot be known. Though the sage wears coarse clothes, his heart is jade. 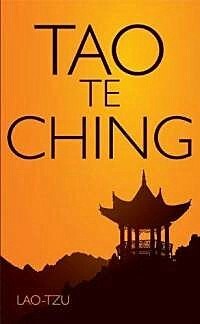 Though the identity of its author(s) has been debated throughout history, Lao Tzu is traditionally regarded as the author of the Tao Te Ching, a system of guidance for developing oneself so as to live in harmony with Tao and the fundamental book of Taoism. 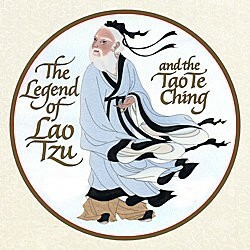 According to the legendary origin of the Tao Te Ching, Lao Tzu worked as the Keeper of the Archives for the Royal Court of Zhou in China during the 6th century BC. Sickened by the immorality and corruption he found at court and by the unwillingness of men to follow the path to natural goodness, he is said to have left the court and ventured west to live as a hermit in the unsettled frontier. At the western gate of the kingdom, he was recognized by a senty. The sentry asked the "Venerable Old Master" to leave behind some record of his wisdom and Lao Tzu is said to produced a collection of 81 poems, often paradoxical, which became the Tao Te Ching. 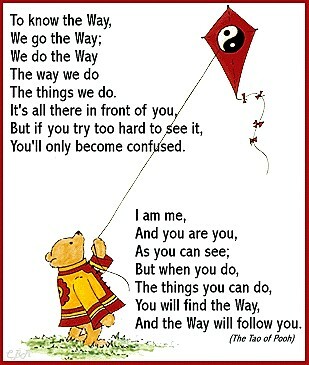 "I suppose," said Pooh, "that's why he never understands anything." The Way of the Tao is a way of being; a way of living, not in conformity to the way of man and society, but in the way of Nature and Spirit. In Taoism, the goal is to achieve harmony with the Tao and with this harmony comes awakening and with awakening comes enlightenment. Enlightenment comes in the casting away of the complex thoughts and behaviors we develop during the living of life in response to the illusions of the world. Enlightenment comes when we accept the plainness of life; when we begin to live in spontaneity and naturalness, living within the Taoist concept of "effortless doing". We begin to be filled with enlightenment when we become an empty bowl, for it is not the substance of the bowl that is of use, but the emptiness that lies within, into which enlightenment may flow. Some might say that we are in harmony with Tao when we find ourselves living in a state of sublime bewilderment; open and accepting; without judgment or prejudice, so that epiphany may enter and carry us from one unfolding mystery to another. The most beautiful and most profound experience is the sensation of the mystical. It is the sower of all true science. who can no longer wonder and stand rapt in awe, is as good as dead. is at the center of true religiousness.